-	We are looking for the volunteers who speak English fluently, willing to help Vietnamese students improve their English. 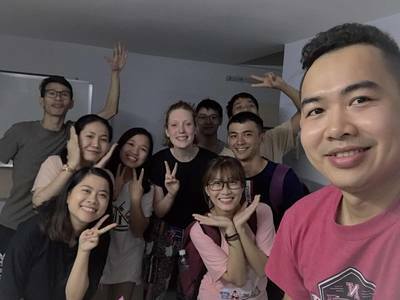 When you join our programs you will have many amazing opportunities and experiences with Vietnamese students like: Prepare daily meals, live and discover our cultures, deep understand of Vietnamese lifestyle, travel, have many good friends and enhance your soft skills when teaching and experiencing our cultures. Volunteer will help us practice English 3-4 hours (mainly less) per day base on your available schedule. -	You will have more local Vietnamese friends. -	Exchange cultures, customs, know more about Vietnamese's life style. -	It is like a journey to experience something new and we want to help to each other: We'll be your tour guide around Sai Gon, local market, mekong delta for free. We have rule of hygiene and english classes (time, change schedule) will discuss more detail with volunteers who interested.